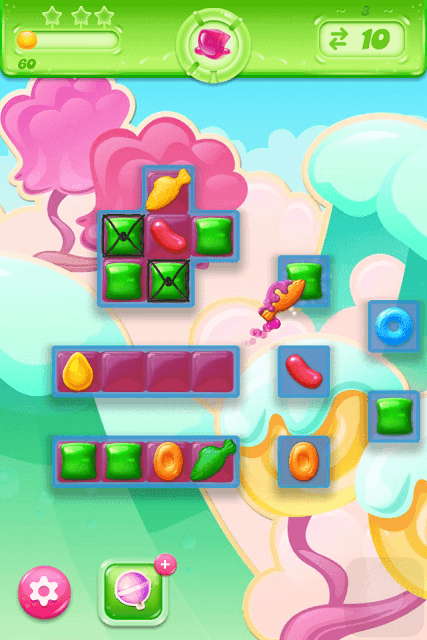 The latest iteration of King’s epic candy-matching game gives a “jellicious” twist to the match-3 puzzler. There’s everything you have seen in previous versions, but the game adds an extra punch and lets you spread your jelly love, discover cute marshmallows and fight the Jelly Queen. There’s also an amazing 3D map to explore. And after candies and jellies, developers at King are now chasing Diamonds. Check out our guide to know more. Several familiar special candies will help you beat levels and bosses before running out of moves. Jelly fish enters the game once again and plays an important role in getting rid of obstacles like frosting and filling empty tiles with jellies. Check out these Candy Crush Jelly Saga cheats, tips and hints if you want to complete levels, find pufflers and make the most of special candies. Fish + vertical striped candy of any color: Fish swims to random column and fills the entire column with jelly or cracks all frosting over it. Fish + horizontal striped candy of any color: Fish swims to a random row and fills the entire row with jelly or cracks frosting. Fish + Wrapped Candy: Fish swims to random area within a board or a separate board and fills tiles in a square with jellies or cracks frosting in a square. Fish + Color Bomb: All candies that belong to fish’s color are removed from the game board and the empty tiles are filled with jellies. If the tiles are covered with frosting, then those frostings will break. Fish + Fish: Swap a fish with another fish to create multiple fishes that randomly swim to different tiles to break frost on them. In Jelly vs. mode, each player will have their own jelly. The goal is to defeat the Queen by spreading your jellies to the entire game board. 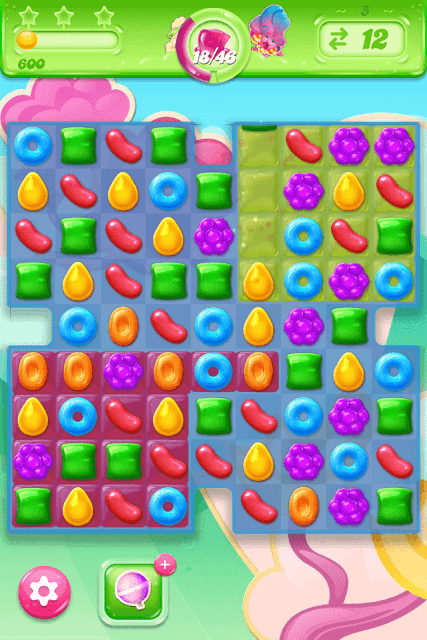 The best way to do is to match candies and make sure that at least one candy is on a jelly-filled tile. Doing this will make the jelly spread to adjacent tiles. 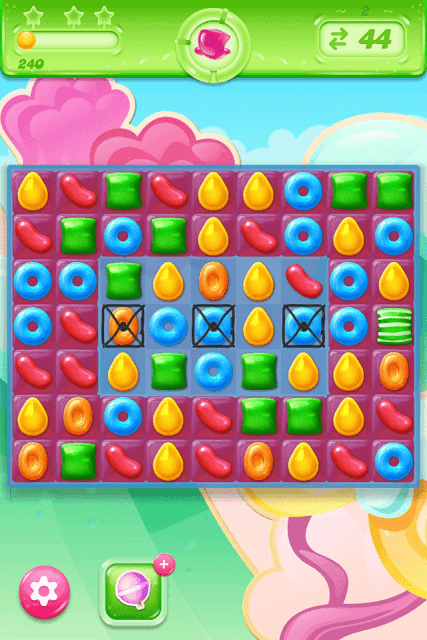 Matching 3 or more candies that are placed on a part of a board that’s already filled with your jellies won’t make any difference. Your objective is to fill your jelly on empty tiles of or opponent’s tiles and fill maximum tiles with them. In the meantime, you will also have to stop your opponent to dominate the game board and the best way is to create special candies, such as the striped ones, the color bomb and wrapped candy. Creating a special candy will stun your opponent and he/she will lose a turn. Create one before your opponent does. Creating 3 special candies in a row will let you gain a special strike. Take advantage of fish to spread jelly/remove frosting. Switch fish with a special candy for bigger effects. This will help you gain more territory. Matching candies on empty tiles won’t spread the jelly. At least one candy in a formation must be on a jelly filled tile to spread it to other empty tiles. When you match 4 candies of the same color, you create a striped candy. Note the direction of the stripe of a candy. Vertical striped candies will remove a column of candies, whereas horizontal striped candies will clear a row of candies. A vertical match will create vertical stripes on a regular candy and a horizontal match will create horizontal stripes on a regular candy. Keep an eye on such matches and the direction of the stripe. When 5 or 6 same-colored candies are in a T, + or L shaped, they create a wrapped candy. A wrapped candy explodes, clearing surrounding candies. But the candy destruction does not stop here. It explodes the second time, clearing more candies surrounding it. Swapping a color bomb with a horizontal striped candy will turn all regular candies of that color into striped candies. All of them will clear rows of candies. Swapping a color bomb with a vertical striped candy will turn all regular candies of that color into striped candies and they will clear columns of candies. Swapping a color bomb with a color bomb clears the board. Switching a color bomb with a wrapped candy will turn all regular candies into wrapped candies. The newly created wrapped candies will explode, clearing surrounding candies. There will also be a second explosion clearing more candies. Don’t give them any room to hide. Keep making bigger matches so that almost 60 percent of the game board is free from ice cover. Try to remove frosting on the middle and then on all four corners. Remember that pufflers hide underneath frosting and if you break most of them, then it would be very difficult for pufflers to move around and hide. Special candies will help you a lot in finding hidden pufflers. So keep creating such candies and try to switch a special candy with another to create bigger effects. Remember your goal is to clear as many frosting as possible to stop them from moving so you must clear more candies over them in a single move. This not only lets you clear more frosting, but also find and confine them to a corner before you run out of moves. You may follow a puffler’s trail and match candies in an area where it’s hiding. Most pufflers hide in all 4 corners so start cracking frosting on all four corners first if you want to spot them early. Keep looking for matches of 3 or more same color candies and break as many frosting as you can to stop them from moving from one area to another and restrict them to one area within the game board. This will make it easier for you to get them. Scan the game board and look for formations that can give a special candy. If you can’t find any, then start matching 3 candies of the same color. But always look out for matches of 4 or more. Also don’t hesitate to swap a special candy with another. This will help reach your objectives faster. You don’t have to connect to Facebook and then request lives from FB buddies. King’s unique concept lets you get lives from random players. On the map screen, tap on the plus button beside the heart and then tap on the “Ask Friends” button. Keep the “Select All” checked and tap on Send. Some players will definitely respond to your lives request.